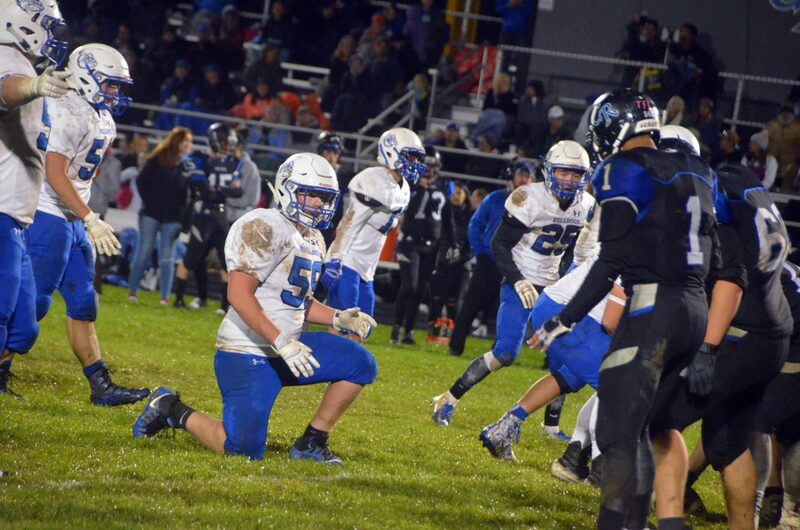 The Moffat County High School defense gets into formation against Coal Ridge. Moffat County High School's Cale Scranton pulls Coal Ridge's Adrian Garcia to the ground in front of the Titan sideline. A Moffat County High School helmet sits atop the water cooler. Moffat County High School's Jared Baker comes around the corner as Coal Ridge quarterback Oscar Salazar hands off to Damian Spell. 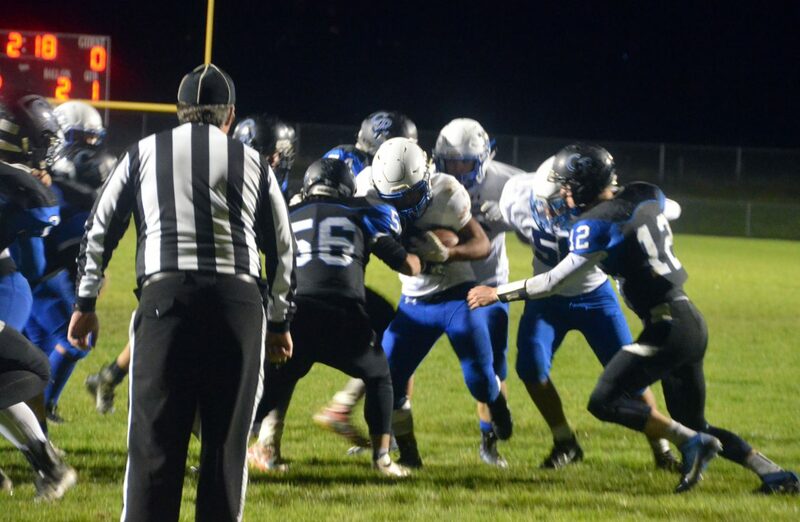 Moffat County High School's Kevin Hernandez drives for the Coal Ridge goal line. Moffat County High School's Colby Beaver gets a pass off before Coal Ridge's Kaleb Mercado can block it. Moffat County High School's Dagan White is on the move along the sidelines during a punt return against Coal Ridge. 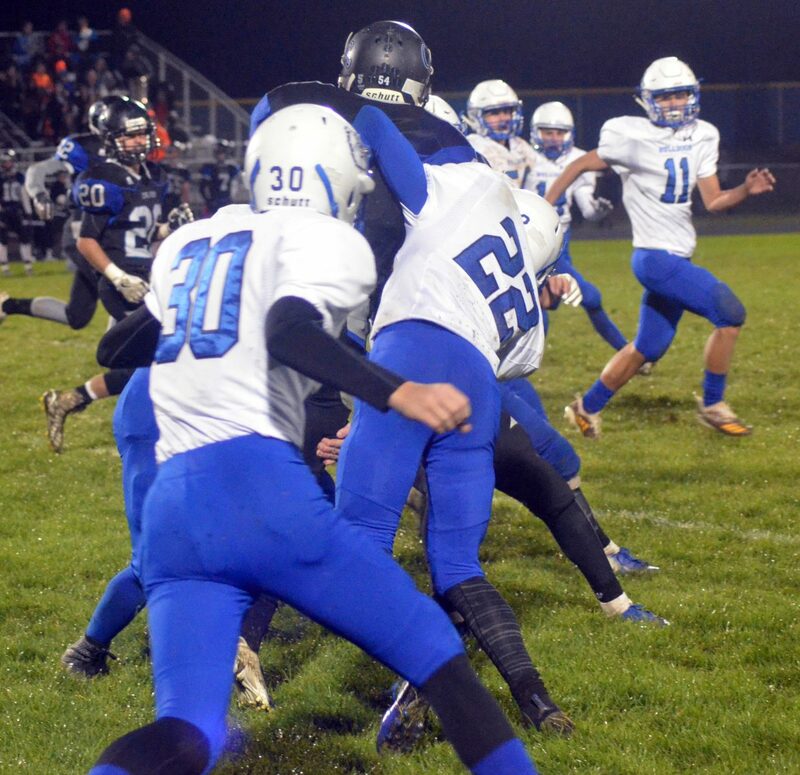 The Moffat County High School defense stacks up against Coal Ridge. 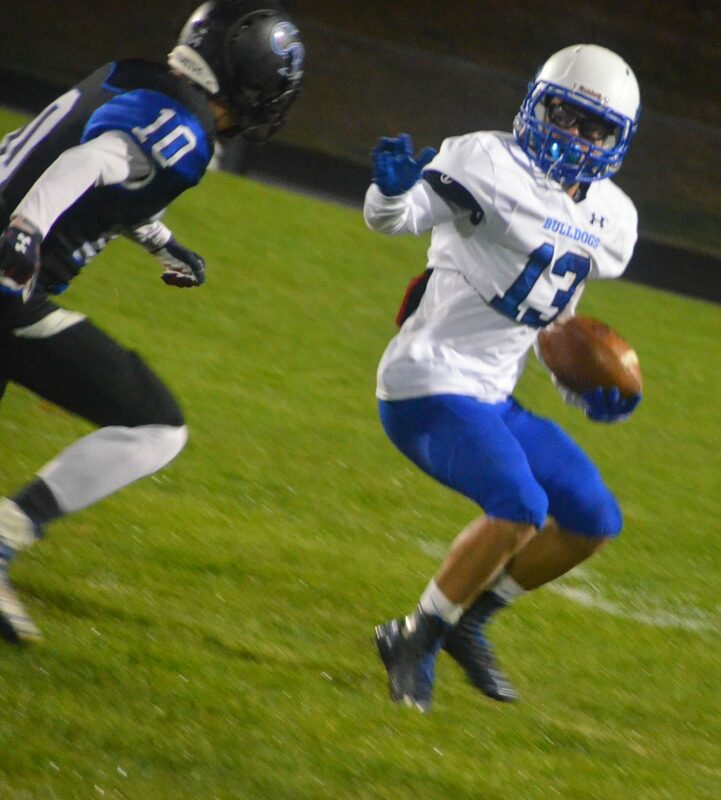 Moffat County High School's Victor Silva looks to get around the Coal Ridge defense. 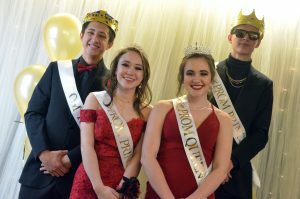 Moffat County High School's Josh Teeter wraps up on Coal Ridge's Damian Spell. Moffat County High School football coach Jamie Nelson motions to managers during a timeout. 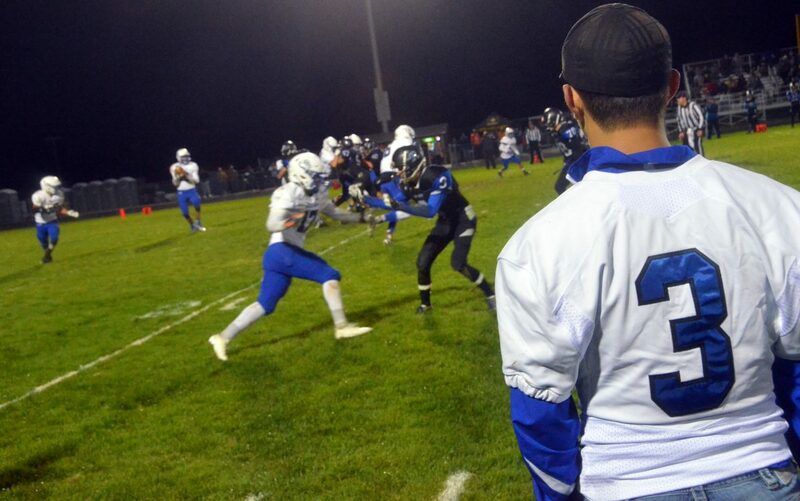 Moffat County High School's Greg Hixson cheers on teammates as they play Coal Ridge. 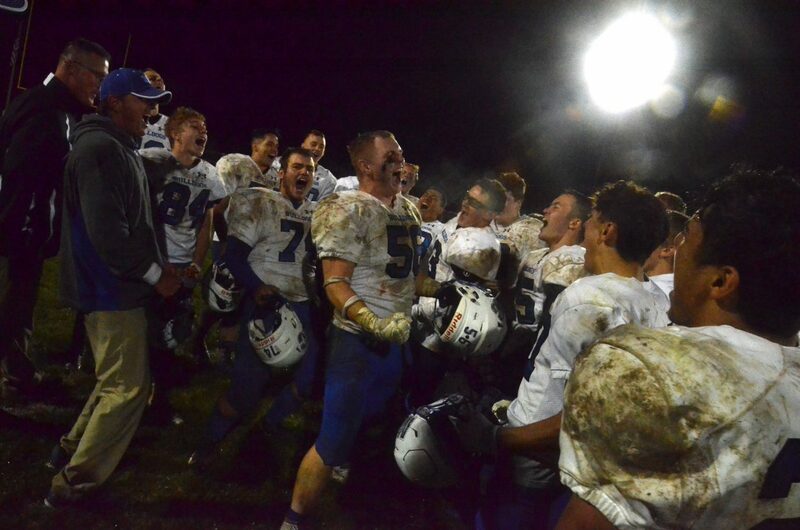 Moffat County High School football players let loose a primal yell in celebration of a Friday win over Coal Ridge. 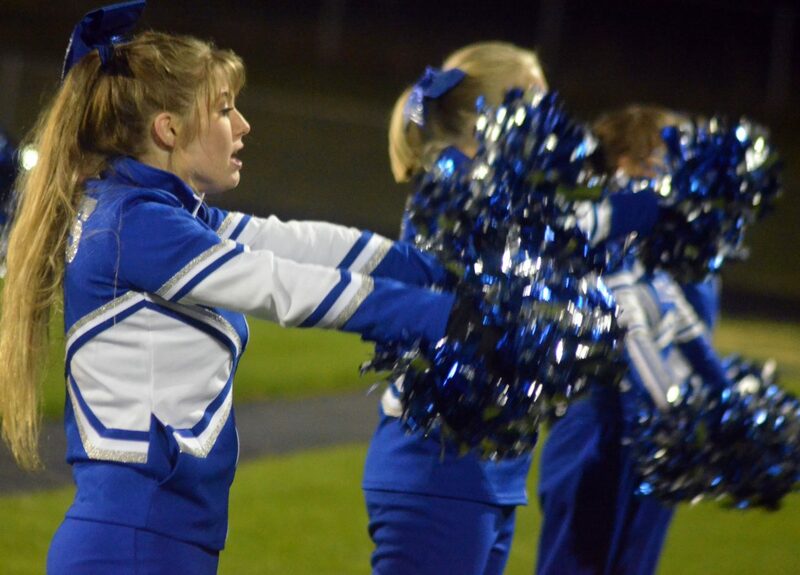 Moffat County High School cheerleaders perform a routine during halftime against Coal Ridge. 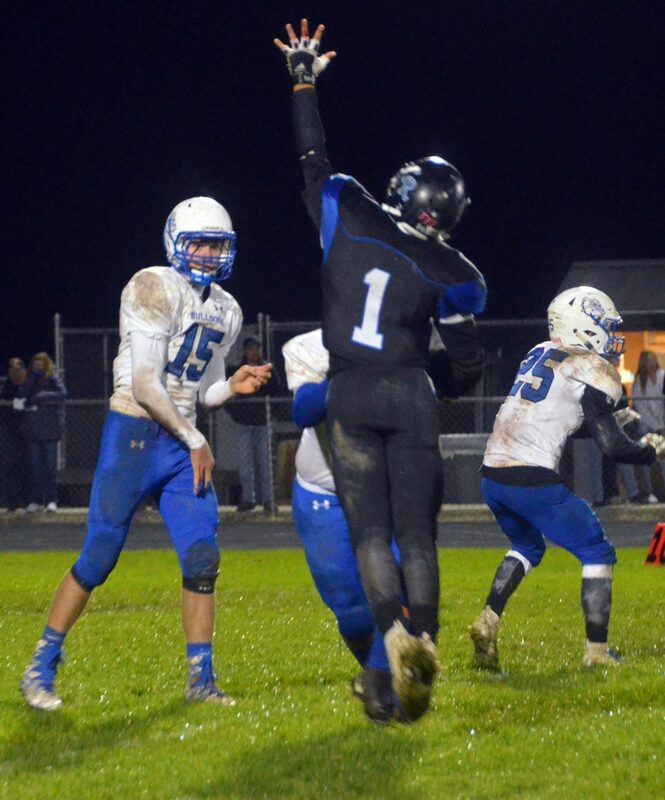 Moffat County High School special teams keep Coal Ridge from making progress on the kick return. 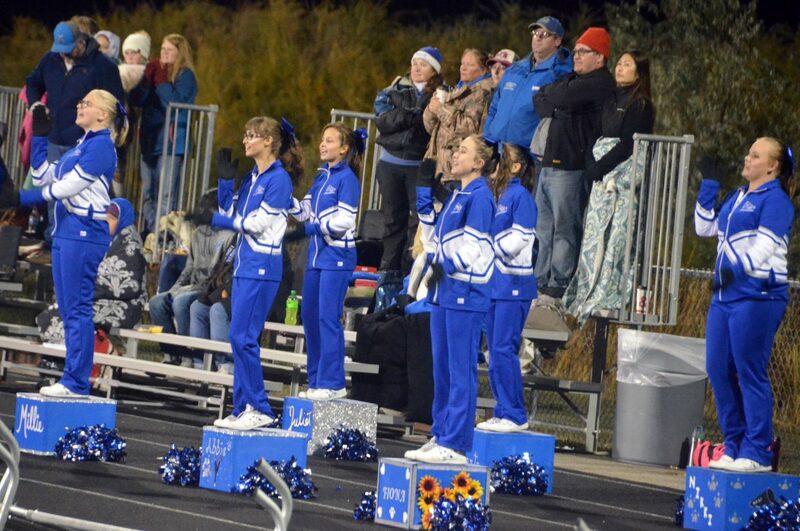 Moffat County High School cheerleaders and fans chant in support of the Bulldogs against Coal Ridge. 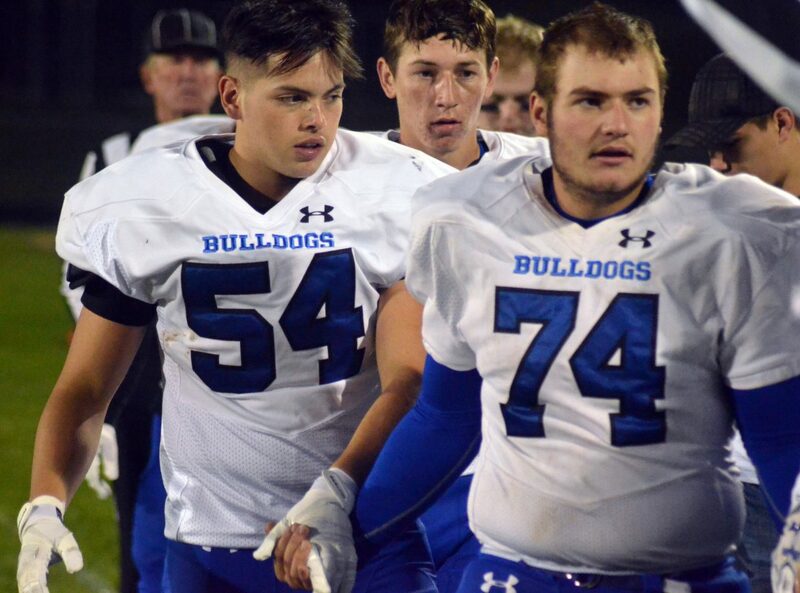 From left, Moffat County High School football seniors Angel Rodriguez, Connor Etzler and Logan Knez prepare to march onto the field for the coin toss against Coal Ridge. 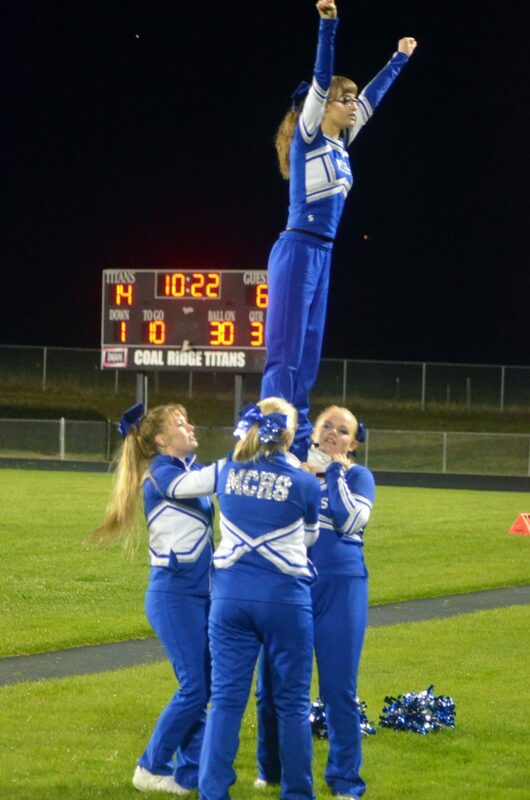 Moffat County High School cheerleaders perform stunt work during halftime against Coal Ridge. 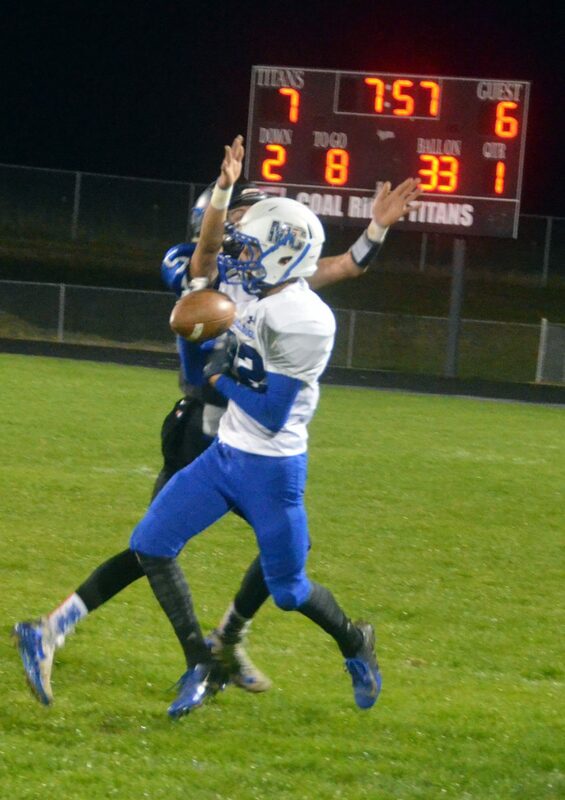 Moffat County High School's Connor Etzler works to hold onto a catch against Coal Ridge. 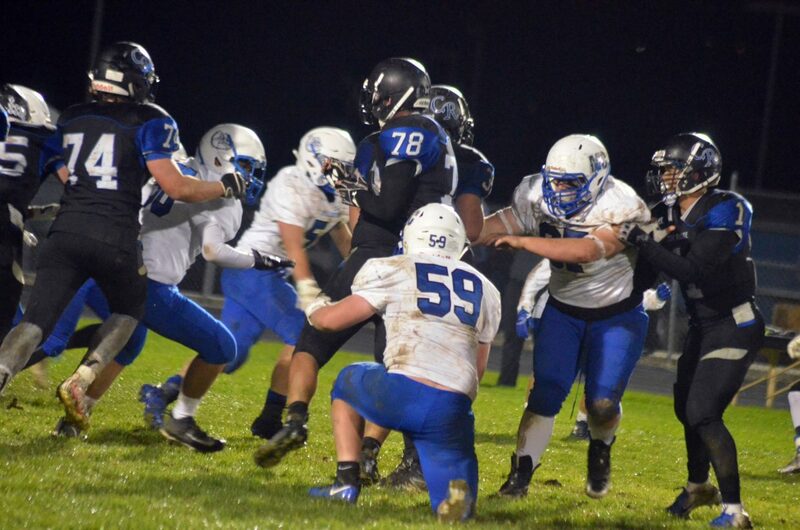 The Moffat County High School defense closes up to slow a Coal Ridge run. 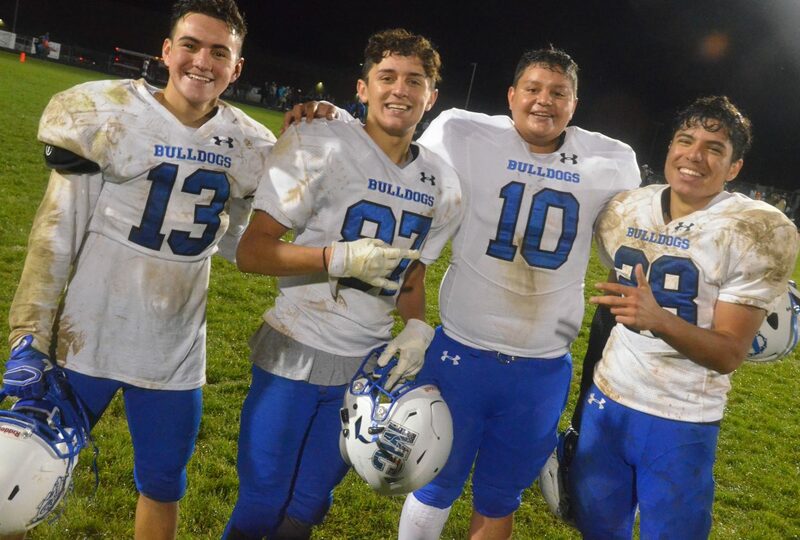 From left, Moffat County High School football players Victor Silva, Dario Alexander, Joahan Quezada and Kevin Hernandez celebrate a win against Coal Ridge. 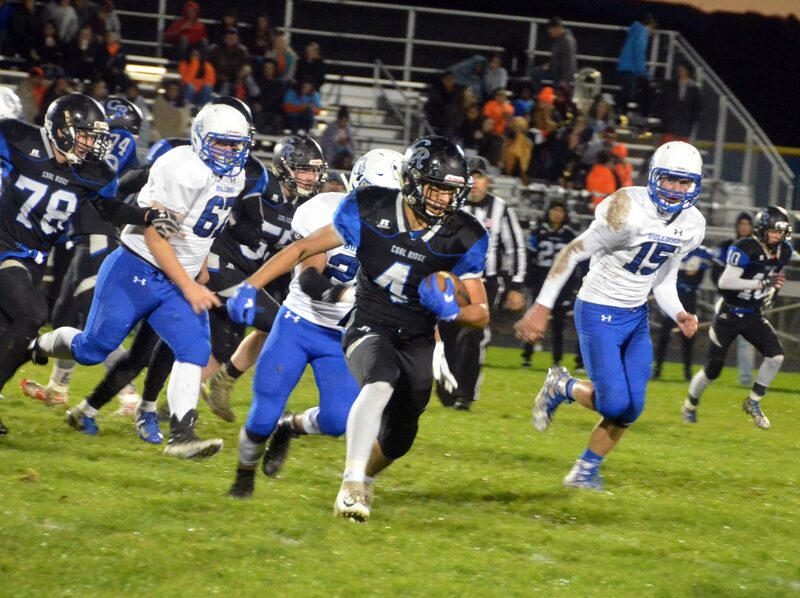 Moffat County High School defenders pursue Coal Ridge running back Adrian Garcia. 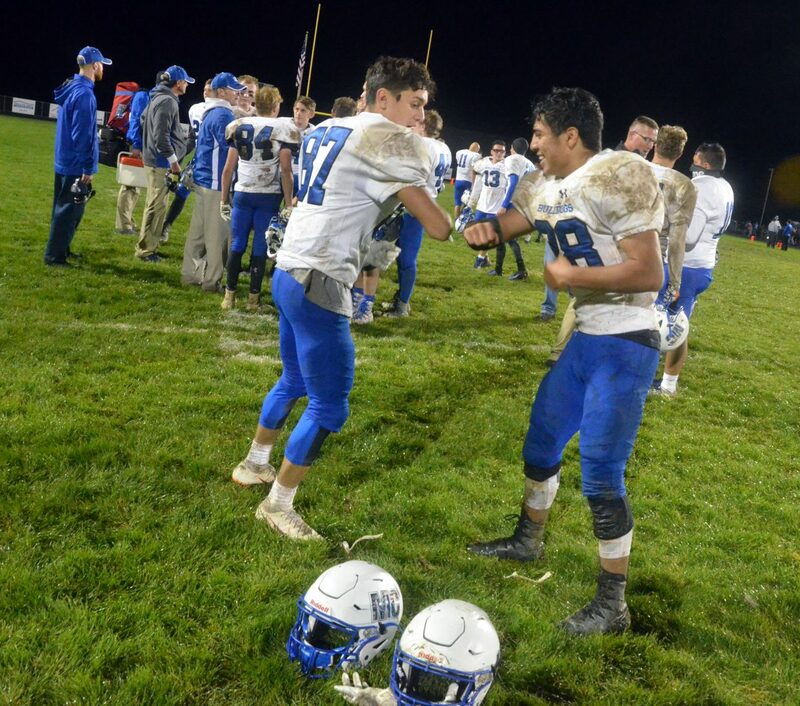 Moffat County High School football players Dario Alexander, left, and Kevin Hernandez share a specialty handshake after a win over Coal Ridge. NEW CASTLE — As far as laundry goes, it’s a minor blessing that Moffat County High School football will be at home for the next couple weeks, because Bulldogs’ away jerseys won’t be fully clean for some time after their latest bout. But, dirty uniforms aside, Craig players had cause to celebrate. 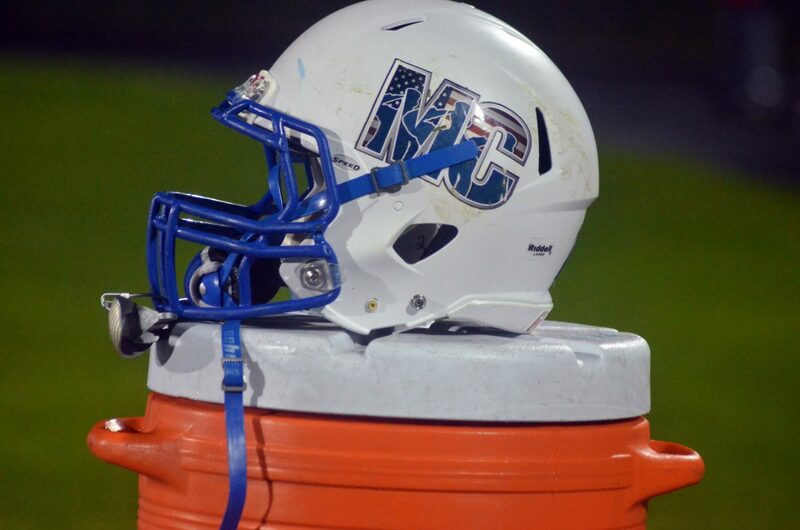 After four straight losses, MCHS earned a hard-fought victory Friday, ending the evening 21-14 on the road against Coal Ridge. 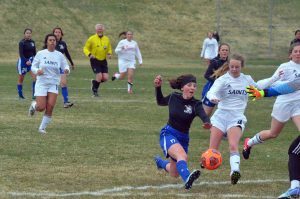 After a rainy loss in Aspen the week before, the Bulldogs’ visit to the Titans’ had clear skies but even soggier conditions than when they met the Skiers with a soaked, muddy field that took no time leaving a mark on the white apparel. The Dogs took little notice, however, as most of their attention was off the ground while on offense. with Colby Beaver getting his arm in gear late in the first quarter in MoCo territory as a 33-yard pass to Cale Scranton got things rolling, and successive throws went to Victor Silva and Josh Teeter for another combined 33 yards. 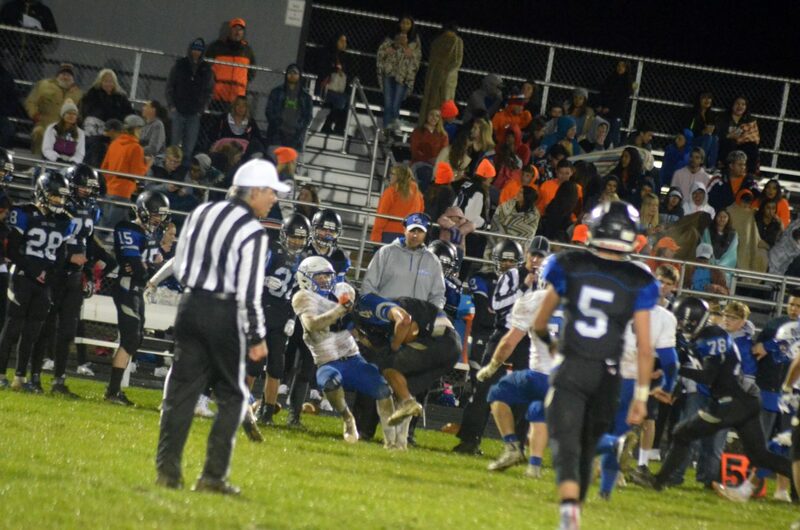 Beaver dove into the end zone from a yard out for the game’s first score, an unsuccessful extra point giving Coal Ridge an energy boost that showed with a spirited kick return that could have gone all the way had Bulldog kicker Joahan Quezada not been in to assist with the stop. Titans wouldn’t score until early in the second quarter as fullback Damian Spell slammed through the Moffat defense for a 1-yard dive, but Coal Ridge was back in the red zone late in the half as they switched up their usual rush strategy, with Oscar Salazar lofting a three-yard pass to Kaleb Mercado to gain the lead 14-6. With only 21 seconds until halftime, the Bulldog drive had a head start as a Titan onside kick attempt flopped, and a 30-yard pass from Beaver to Dario Alexander got visiting fans on their feet as the Moffat receiver got out of bounds with one second remaining. 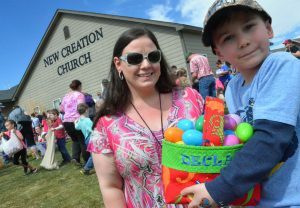 “I knew I really had to step up and play football,” Alexander said. 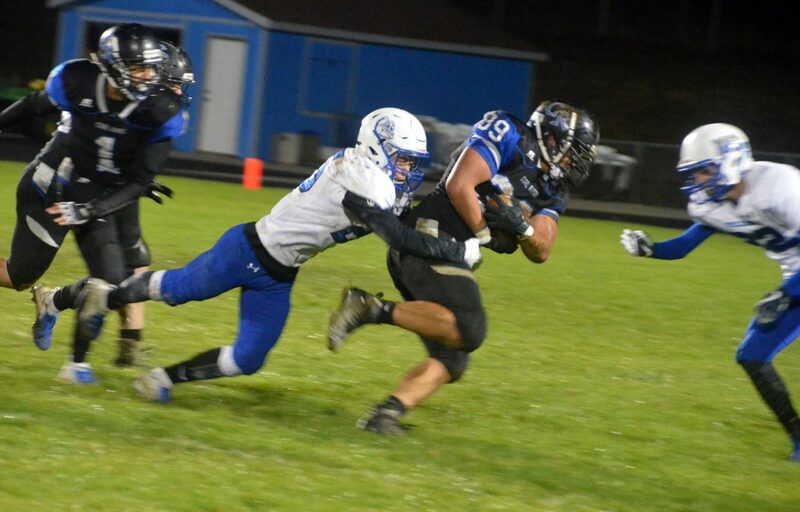 Beaver found the same target again in the middle of the field, but despite fighting every step of the way in a 28-yard catch, Alexander couldn’t quite get to the end zone, downed by Coal Ridge at the 3 as the half ended. Still, the back-to-back receptions were by no mean Alexander’s biggest moments. A completely scoreless, penalty-filled third quarter ended with Coal Ridge in scoring position once again at the Bulldog 18, but the Titan tactic of handoffs to Spell and Adrian Garcia — and the occasional keeper by Salazar — stopped finding success as the Dogs’ D-Line became a force field. At fourth and long, Coal Ridge took a gamble with a 32-yard field goal attempt that didn’t split the uprights, expecting that even with the miss, MCHS would be pushed too far back. But, the Titans couldn’t have anticipated what happened next. Beaver took the snap and threw what looked like a screen pass directly to his left to Cale Scranton. Rather than running, Scranton shocked the Titan sideline by sailing a second pass on the play to Alexander, who took the pigskin all the way home on the 78-yard catch. Beaver muscled his way through a frazzled Coal Ridge defense to claim the two-point conversion, and just like that, the game was even. The Dogs looked like they’d score again immediately as an onside kick was recovered by Kevin Hernandez, though the Titans shut down their move downfield, including hurrying Beaver into a high incomplete pass to Scranton on fourth down. That was all MoCo men needed as motivation to make a statement, refusing any and all Coal Ridge attempts to cross the 50, forcing a Titan punt. 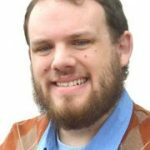 Starting from their own 31, the Bulldogs stuck to the ground route, as Hernandez, who only had one rushing yard to his name at that point, grabbed the ball from a handoff by Beaver and didn’t look back — unless you count the multiple spins that were part of his speedy, serpentine path to a 52-yard gain. Once where they wanted to be, it was a reverse to Silva that gained the additional 18 yards for MoCo and their third touchdown, capped off by the PAT from Quezada. 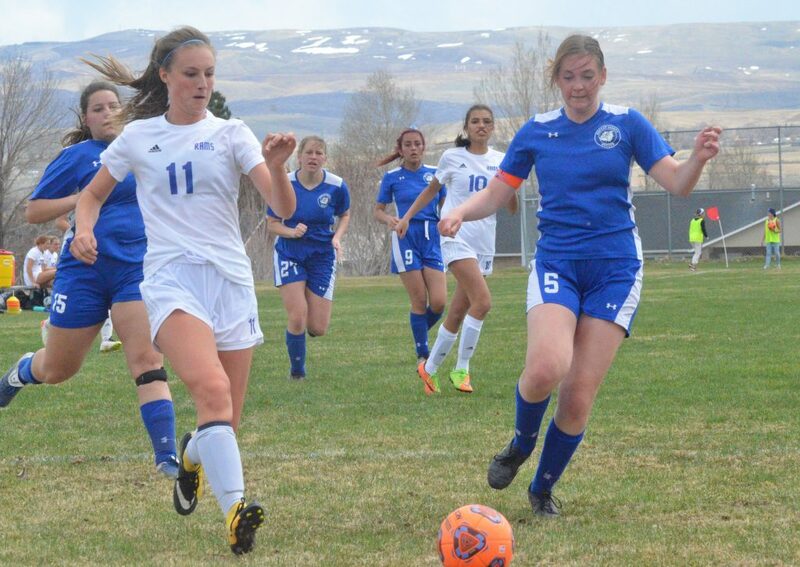 With about four minutes remaining, Titans still had the opportunity to gain their second win of the season, which would have also been their first victory against MCHS since the Bulldogs joined the 2A Western Slope League. 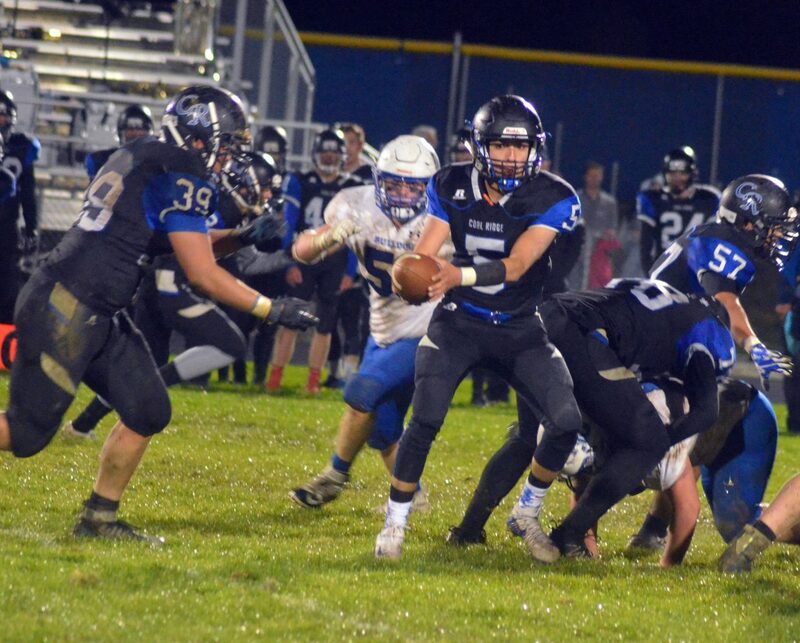 But, the Coal Ridge crew had too much working against them as Karson Dubois took over at quarterback for Salazar, who was nursing a shoulder injury, and the Dogs went into attack mode. 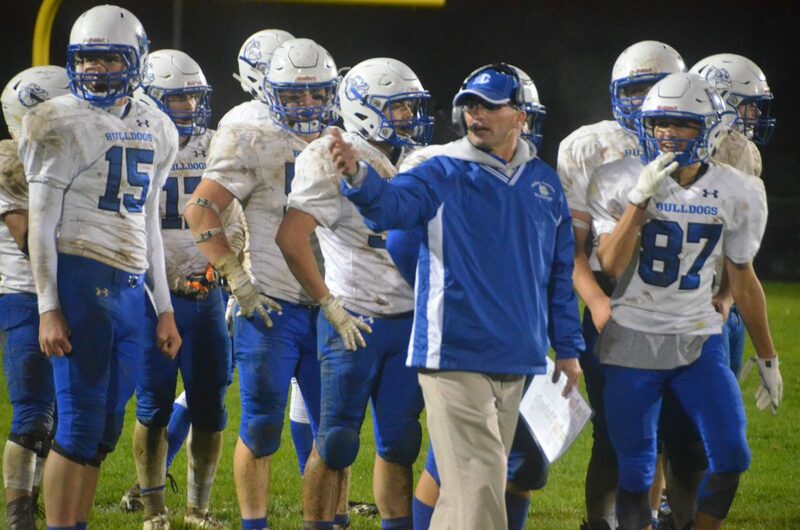 The Titan drive went as far as the MoCo 32, but a fourth down sack by Hernandez gave the Dogs the ball with a few seconds left as Beaver took a knee to send the team to the sideline to sing the school song with heavy mud stains badges of honor. Nelson noted it’s the team parents who can clean such a mess who will be the real MVPs. Despite going backward more than forward on rush attempts with a total -5 yards, Beaver threw 156 altogether, 13 for 25 in accuracy. 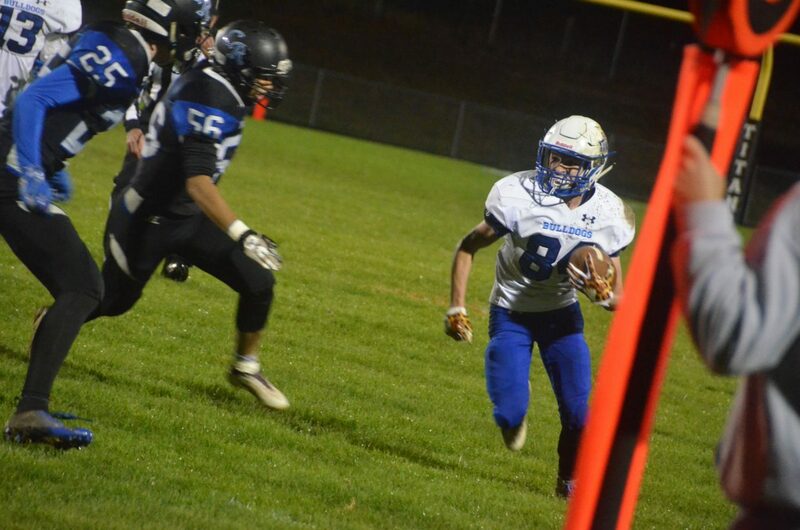 Between Cale Scranton’s TD pass and the two receptions off Beaver, Alexander had the best receiving game of his varsity career with 136 yards. With more than 70 tackles across the roster for the night, Teeter led with 15 total including 10 solo. Cale Scranton followed with 10, Hernandez had nine and Angel Rodriguez eight. 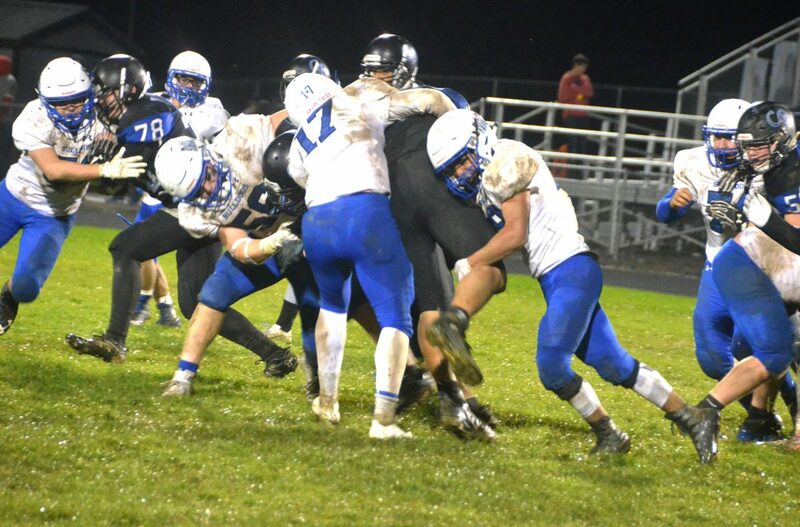 The Dogs’ four sacks were shared by Teeter, Hernandez, Logan Knez, Jared Baker and Corey Scranton. While Coal Ridge languishes at the bottom of the conference rankings, Bulldogs improve to 3-4 on the season, the game also making them the highest-scoring 2A WSL team of the week. Just down the road from the MoCo win, Rifle took its first loss of the year in a 20-19 upset by Aspen, which leaves 7-0 Basalt alone with the league lead after a 13-0 defeat of Delta the same night. 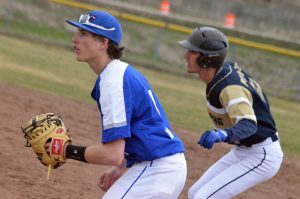 Moffat County athletes will face the Delta Panthers Oct. 19 and the Rifle Bears Oct. 26 to round out the regular schedule, both at home. The win against the Titans was narrower than Nelson would have liked, but it was nonetheless an important one after the 51-7 drubbing by Aspen.